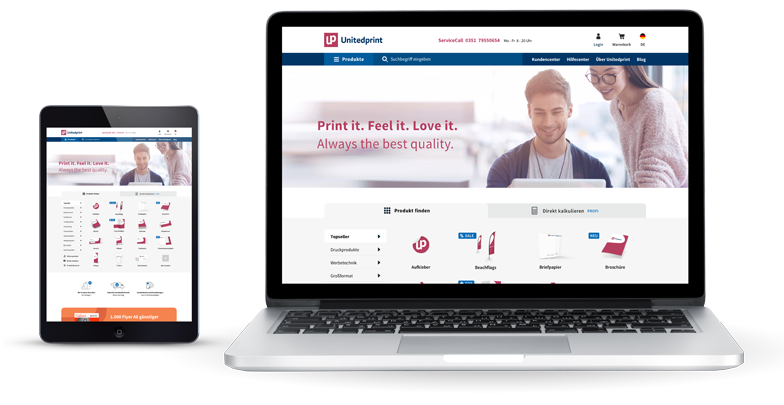 Unitedprint is the B2B online print shop that meets the high demands of agencies, graphic designers and SMEs around major cities throughout Europe, such as Cologne, Glasgow, Seville, Lille, Salzburg and Lausanne, who are even supported by our team locally and on site. Customers can choose from a full range of printing, textile and advertising products that are easy to order online. This guarantees transparent prices without any hidden costs. If customers need personal support from our specialists, they can also find it quickly and conveniently via ServiceCall.